Humanity Pride Productions, Green Light Films and Diamond Jesus Productions released the official trailer for the new comedy film, The Jersey Devil today. The trailer contains several riotous moments as it reveals the plot of the film. Lucifer’s term limits are up, a new devil is in, and Jersey City, New Jersey is the new location for Hell. The film stars; Chris Mulkey (“Captain Phillips”, “Boardwalk Empire”,”Cloverfield”), David Chokachi (“Baywatch”), Award Winning Actor Keith Collins (“The Meat Puppet”,”Gravedigger”), Jack Mulcahy (“The Brothers McMullen”,”Porky’s”), Edvin Ortega ("Orange is the New Black"), Award Winning Actress Penelope Lagos (“Stuck in the Middle"). When his term limit comes up, Lucifer, the original Devil, must turn the reigns of Hell over to James Burnett. But Burnett has new plans for Hell that includes changing its' image and relocation. He enlists his Advocate, Richard Cooper and his beautiful sidekick Tori to find a new home for the damned. After an extensive search, they settle on New Jersey. As construction begins, James implements his plan to gather as many souls as possible so he can challenge the Kingdom. Meanwhile, Lucifer, with his wife Eve and Advocate Judas have arrived in Jersey to put an end to James' plans. After several failed attempts to stop him, Lucifer turns to a higher power for help. 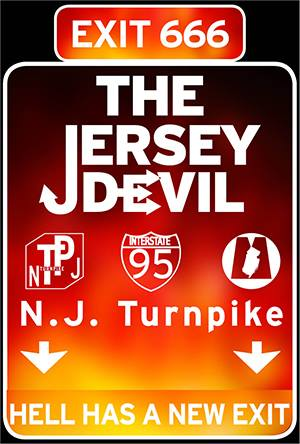 “The Jersey Devil” and Jersey City, NJ are a match made in….HELL!! With the support of the FilmJC and the Mayor’s Office, The Jersey Devil was filmed throughout Jersey City early this year. Scenes were filmed at several well-known locations including the Landmark Loews’s Jersey Theater, NJCU and City Hall. Jersey City provided a perfect backdrop for the hipper, more contemporary Hell. “The Jersey Devil” is directed by two-time New York Emmy winner Joseph Pepitone(“Stuck in the Middle”). Written By, Joseph Pepitone and Billy Pepitone. Produced By, Jeff Quinlan, Keith Collins, Ed Luster, Jay Andriani and Joseph Pepitone. Executive Producers Michael Billy, Jarl Haugedal, Dorothy Fucito, Debbie Philips, Charles Anastasia, Larry Salvato, John Camera, Frank Sepe, Jessica Pell & Kimberly Clemente.